Enjoying the day are members of the Kansas City, Missouri TCC Chapter. 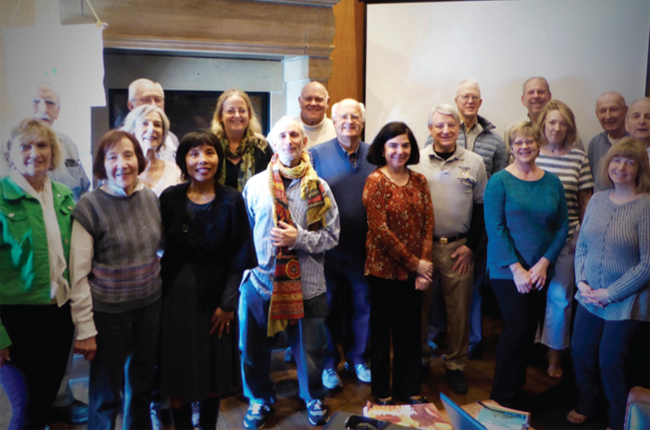 Twenty members and guests attended the March 30 meeting of the TCC chapter in Kansas City. Mr. John Dranchak, who recently moved to the area from Denver, presented an interesting program on his trip to Azerbaijan, Georgia and Armenia. The trivia question was presented in two parts: What country has three capitals? (Answer: South Africa), and what two countries don’t have a recognized national capital? (Nauru and Switzerland). The correct answer was provided by Chuck Battey. Future club meetings in 2018 will be held at 11 a.m. on Fridays: June 29, Sept. 28 and Dec. 7. Several members expressed interest in attending the TCC Barcelona meeting in October. Special thanks was given to Charles Merkel for the very successful Crystal Bridges weekend of art and travel held the previous weekend in Arkansas (click to learn more).